By African Cinema, I mean all the African classics produced from whichever sort of funding- may it government, NGOs or otherwise. Films that have been released, not with a market in mind but as long as there was someone paying the bills. Great films by Gaston Kaboré and even Nigerian legend animator Mustapha Alassane oh yes, and that's great we should celebrate. Award winning pieces like Drum created by Zola Maseko in South alright but who has watched any of them? I have watched Drum. 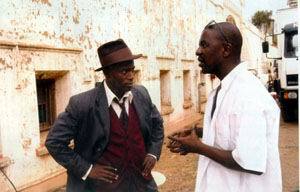 This great film, easily draws you into it and has your attention throughout but that does not change the sad situation on the ground: African cinema has only been for a few festival goers' privileged artists who receive invites for the few private screenings mostly held in the foreign cultural centers in African cities. Lests face the facts. In the last five or so decades, African filmmakers little effort to created a sustainable film industry- everyone is very busy amassing funding for their projects. This way, the few cinema halls throughout the continent collapsed, there were no spaces to exhibit. 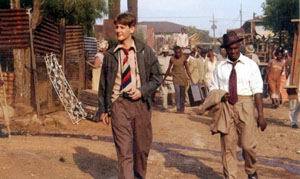 The few that remained were mostly foreign owned, screened movies that they wanted to market to Africans. Most of this time, the African filmmakers was very busy looking for funding, producing movies that would end up under their pillows. There was not any time to invite art marketers to whip Africans into consuming their films. In most cases, there was not even an attempt to screen these films to paying masses, where this was attempted, it only lasted very briefly. In this vacuum, Hollywood movies- which have obviously been a low quality affair- entrenched themselves into the market. Indian movies joined later, first through TV dramas and finally here they have a base. What happens when the funding dries or has it already? Paper edited in Bulletin Africiné n°10 (Ouagadougou), 5th March 2009, and Bulletin Africiné n°11 (Ouagadougou), 7th March 2009, during the Fespaco 2009.